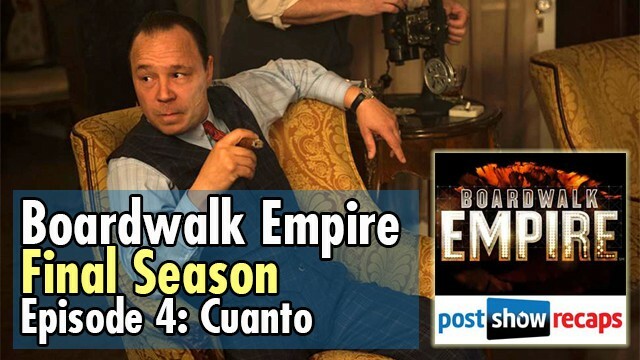 Antonio Mazzaro (@acmazzaro) and Jeremiah Panhorst (@jpanhorst) recap episode 4 of the final season of HBO’s Boardwalk Empire, “Cuanto”. • Why is Enoch so bothered by the swells? • What did we learn from the dinner scene at Sheriff Lindsay house? • Enoch request to have his father jailed or killed. Does this shows us that Enoch was breaking bad at an early age? • Will Sheriff Lindsay be more of a mentor to Enoch than the Commodore? • Will we see a teen Enoch and Eli next? • Joe is not interested in teaming up with Nucky, because Scotch does not mix with rum. What do we make of this? • Did we like how Nucky and Margaret open up about there first impressions of each other? • What do we think of Nucky’s solution to the problem with Rothstein’s widow? • Is Nucky up to something else? • What is going on with Bacardi? • Sally gets killed by local authorities. Would things have been different if Nucky was there to deliver the money? • Is this the end of the Bacardi deal? • Wallace Beery plays a gangster in the movie The Secret Six. Is this why Al Capone was offended by this reference? • Do we like the clear Goodfellas reference? • Did we think Van was a goner when Luciano recognizes him? • How awesome was the Van shakedown scene? • What is going to happen to Van, now that the Feds know who he is? 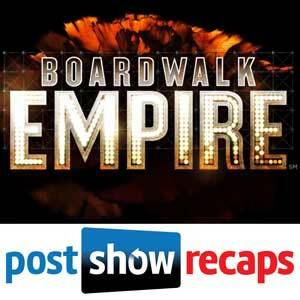 • It looks like Al Capone plans to help Nucky, what does this mean for Luciano’s plan?